The US pork industry is a dynamic and versatile industry that have progressed over the past 50 years from producing lard-type pigs to a more meaty and heavier muscled animal (Cunha, 2012). This change in progress is due to the current global population estimated at over 7.2 billion people and growing at a rate of 1.14% per annum ( Worldometers, 2014), thus placing a direct strain on agricultural production and evidently the livestock industry. The livestock industry has always played a vital role in the human food supply by producing high quality protein foods, such as meat, eggs and milk. However this continuous growth in population has also lead to a high demand in the consumption of pork and pork products. Pork is one of the world most widely consumed red meat, providing an important source of energy, protein and vitamins (NRC, 1998). In a recent report, (NPPC, 2014) reported that since 2011 the pork industry produced nearly $21.8 billion in personal income from total sales of more than $97 billon and added $34.5 billion to the country’s gross national product. However, this change in dynamics has placed a great emphasis on increasing feed efficiency and yields on less feed, as feed cost continue to increase. Thus one of the most important considerations that producers should bear in mind is proper formulation of diets. This is fundamental to the efficient production of swine, (NRC, 1998). Providing feed for pigs in the growing phase is one of the largest and most consistent variables in swine production. This ultimately results in low rates of return on investment of the operation and producers have little or no impact on the market price of their animal, (Sainz & Paulino, 2004). On average feed cost represents 65-75 % of the total out of pocket expenses for any livestock production(NPB, 2008) and with the ever increasing cost of feed the need to enhance overall production efficiency and profitability is of major concern for the future. In recent years, a vast amount of attention has been given to feed efficiency in livestock production and this has a direct link to the overwhelming increase in the price of feed. (S.M Cruzen et al., 2013). Improvement in assessing the efficiency of individual animals has been of interest for many years (Moore, Mujibi, & Sherman, 2009), as a means of increasing Feed efficiency (FE), and keeping production cost at a minimum. 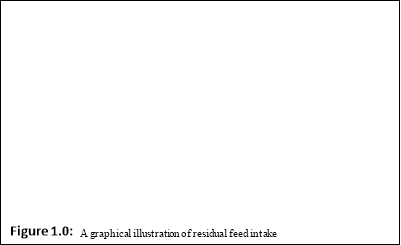 FE is the amount of feed required per unit of gain, and is often computed as a ratio (Koch et al., 1963) and (Herd, Oddy, & Richardson, 2004). Traditionally, various measures of FE were proposed, and includes the ratios of feed: gain (F: G) or gain: feed (G: F) feed conversion ratio (FCR). However, (Koots, Gibson, & Wilson, 1994) suggested that despite their widespread use in the livestock industry these measures were undesired of genetic improvement, because they are often correlated with growth rate, such as ADG or BW. (F. C. Gunsett, 1984), reported that selective pressure on the components of a ratio trait is not predictable , given that more intensity is usually placed on the component with greater variation, and was further confirmed by (Crews, 2005), that indeed a unit improvement in a ration does not imply overall efficiency, such that the improvement is unpredictable. Traditionally FG ratios was seen as misleading and give rise to confusing results that a higher ratio is suggestive of a lower efficiency, (Sainz & Paulino, 2004). Today; FCR are expressed as a gain: feed ratio to overcome such problem ( Carstens et al.,2004), however these measures of FE were deemed difficult to improve through direct selection because it is difficult to measure on an individual basis and because of the problems associated with selection on ratio measures (Gunsett, 1986); Iwaisaki 1989). Knap and Wang, (2012), in a recent times showed that FCR has been decreased over the past 35 years from 3.0- 3.6 to 2.6 – 3.3. Ultimately (Koch et al., 1963) suggested an alternative which will seek to alleviate some of the problems the industry has faced while taking advantage of individual animal variation such as genotype, gender, maintenance requirement, diet and other environmental factors, by using the genetic parameters of Residual Feed Intake (RFI). (Koch et al., 1963). The concept of RFI is a fairly new technique and was first introduced in beef cattle in 1963.RFI is a unique technique and is arguable one of the best measures for measuring FE and is now widely practiced as a selection tool. Its use have been evident in species such as; laying hens (Luiting and Urff, 1991), cattle (Arthur et al., 2001; Nkrumah et al., 2007), pigs (Gilbert et al., 2007; Cali et al., 2008) and in fish (Grima et al., 2008). Cali et al, (2008), suggested that FI is genetically related to the economically important production traits of growth and back fat. These traits however, an account for approximately 36 to 64% of the variation in FI (Luiting, 1990) and this unaccounted portion of variation is referred to as RFI. Given that selection for RFI is associated with differences in intake; (Kellner, 1890’s) noted that those animals that eat less for the same performance could be expected to have less energy expended as heat increment of feed (HIF). One important consideration that should be noted while calculating fir RFI is the adjustments made for FI for ADG (Johnson et al., 1999; Hoque et al., 2009), ADG and backfat (BF), loin muscle content and metabolic body weight in order to only account for the variation in FI that are unrelated to production traits ( Hoque et al., 2009). RFI is independent of growth and body weight and is moderately heritable (Authur et al., 2001 a; Crews, 2005) and as such gives credence in making this technique a good candidate for genetic improvement. For this reason RFI selection for low RFI can significantly decrease the amount of FI required for a given rate of growth and BF (Cai et. al 2008). Therefore pigs that are selected for low RFI will consume less feed than expected based on their growth and maintenance requirements compared to inefficient animals. Knap and Wang (2012), showed in a study that for any genetically system selected to be more efficient, they tend to be more sensitive as a side effect thus, giving rise to a vulnerable and weak immune system which may not be able to overcome stressors and diseases (Flori, et al., 2011; Rauw et al., 1998). This was proven in a study where selection for a low RFI pig resulted in correlated responses of behaviour traits, (Dekkers and Gilbert, 2010). RFI has adapted more intensively in countries such as Australia and Canada but in the US more attention has been given to understand the biological issues surrounding this concept. 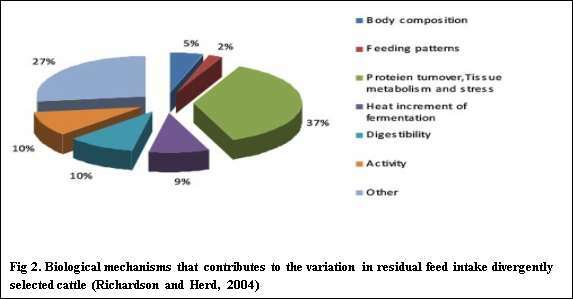 There are several considerable factors that contributes to genetic variation in RFI, which includes: digestibility, body composition, physical activity, tissue turnover rates( protein), maintenance requirements, energetic efficiency, activity levels of immune system, food wastage and measurement errors, (Dekkers and Herd, (2010). Variation in RFI has shown to reflect differences in efficiency with individual used for production and maintenance of body weight, as well as errors in prediction. In a review by (Archer et al., 1999) and (Pitchford, 2004), there was considerable amount of evidence to support a genetic basis to the variation in efficiency across these species, with estimates for the heritability of RFI which ranges from low to moderate. Luiting , (1998) , reported that the observed genetic differences in the ability to digest nutrients are small in comparison to the differences in maintenance requirements which plays a major role. Rauw et al, (1998) further suggested that although reduced maintenance requirements are desirable for improved FE; there is a tendency for it to result in reduced fitness and increased susceptibility to stress and diseased animals. These key factors, however have only been quantified partially to an extent in species such as poultry (Luiting, 1990), beef cattle (Richardson and Herd, 2004), and in pigs (Barea et al., 2010). These predictions of FI have been largely based on phenotypic regression of FI on measures of production and BW. Arthur, 2009 reported that cattle’s show a 10 – 12 % reduction in feed intake. Nkrumah (2006) and Hegarty (2007) reported that previous study with cattle demonstrated that more efficient cattle have multiple benefits such as decreased in dry matter intake (DMI), less manure production and less emission of methane. Pitchford, (2004) showed that a large portion of metabolizable. Energy (ME) of any ration is used for maintenance. Crews, 2006, suggested that RFI has become a desirable measure for characterising feed efficiency due to the fact that it allows for inclusion of more “energy sinks” and allows for comparisons between animals across different segments of production and different stages of development while describing individual animal differences. The Economic implication of Residual feed intake is seemed as been expensive. This is due to the fact that individual animal feed intake data must be obtained for accurate estimation of Residual Feed Intake; and is only possible through the use of expensive equipment. 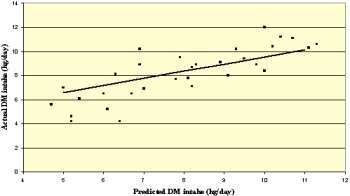 However studies have shown that recording individual animal feed Intake is the only means of obtaining an accurate estimation of Residual Feed Intake without losing information on inherit differences between individuals (S.S. Moore, F.D. Mujibi, and E.L. Sherman). (Hegartly et al., 2007) reported that the total savings from increasing animal efficiency would be most likely considered for replacement heifer that stay longer in the herd; and as such selection for greater feed efficiency could potentially result in a reduction of 9 to 10% in maintenance cost for the cow herd; a 10 to 12 % reduction in feed intake, a reduction in methane emissions by 25to 30%. (Basarab et al., 2002) also reported a reduction in manure production by 15 to 20 % without affecting ADG or mature cow size. With the current global population of over 7 billion people and growing at a rate of 1.14% per annum (World meters, 2014), improvements in feed efficiency would be of great help to the live stock industry. It is evident that the live stock industry plays an integral role in human food supply by producing high quality protein foods such as meat, eggs and milk. And as such recent and increasing demands in animal agriculture has been geared towards increasing feed efficiency and yield on less feed as feed cost continue to increase. Although, the planet has an enormous capacity for livestock and plant production, the increased demand for food places a further strain on current agricultural production resources. The livestock industry plays an integral part in human food supply by producing high quality protein foods (meat, eggs, and milk). However, the ever-changing landscape of animal agriculture has placed emphasis on increasing feed efficiency and yields on less feed, as feed costs continue to rise. Research has shown that there is a direct link between feed cost and feed efficiency (FE), and as such selection for FE has been studied in previous years in various farm animals , however little is known about the effect of divergent selection for Residual Feed Intake (RFI) on the efficiency of Amino Acid (AA) utilization in growing pigs. Improving FE in pigs is very important because it reduces both the cost of production and the environmental impact of pig production, however direct selection for genetic improvement in FE, has not been widely practiced for a number of reasons, which include the fact that FE is difficult to measure for individual pigs and results in high labour and equipment cost (Jungst et al., 1981; Mrode and Kennedy, 1993). In the past, improved FE was considered a by-product of selection for increased growth rate. However, this method is biased in that faster growing animals are usually larger and therefore have increased energy maintenance requirements. Even when considering mature size differences, not all animals have identical metabolic efficiency, resulting in slow genetic progress. Luiting et al. ( 1991), in an experiment with laying hens, shows that variation in maintenance energy expenditure was a major contributor to variation in RFI between hens with similar egg mass production and BW. Archer et al., 1998, shows that there is indeed individual animal variation in feed intake (FI) above and below the expected or predicted basis of size and growth rate such as in mice, while, ( Byerly , 1942; Luiting and Urff, 1991) proved that in poultry and the same result was observed in pigs ( Foster et al., 1983; Gilbert et al., 2007; Hogue et al., 2007. Strong evidence for genetic basis to this notable variation in efficiency across these species were reported in previous studies by Archer et al., (1999) and (Pitchford 2004) in cattle. The largest impact for ranchers when using RFI values in a selection program is reduced feed costs. This occurs because cattle with low RFI values consume less feed. It has been demonstrated in numerous studies that “selection for lower RFI will decrease FI in young cattle and cows, with no detrimental effects on growth or size of animal” (Herd et al., 2003). Thus, this benefit is two – fold. Not only will cattle consume less, but at market time they will still stand up at market conditions and standards. As an example, in contrast to high RFI value steers, low RFI value steers had more lean meat and less fat in their carcasses (Richardson et al., 2001). Directly selecting for feed efficiency requires measuring the feed intake of each animal, which was difficult and expensive in the past. However, measuring individual FI has been made practical through the use of new technologies and is now being used to enable a new approach to improving FE.